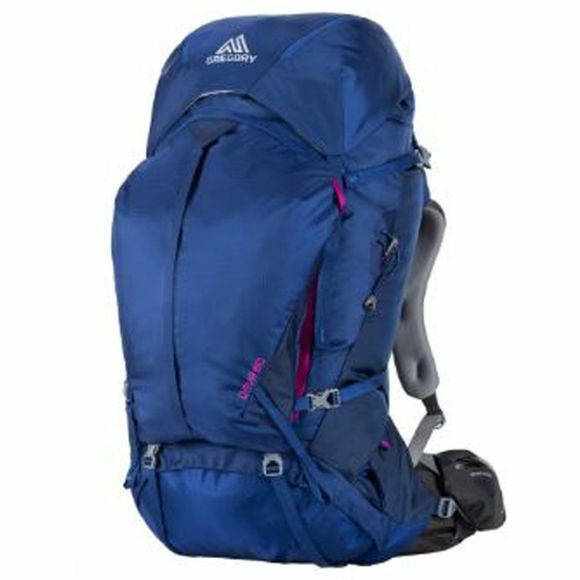 The Deva 60 Rucksack from Gregory is a tough and durable pack that will store all your kit securely on multi-day trips. The sturdy and comfortable Women's specific Response A3 Suspension system is the reason these packs remain comfortable and balanced. They adapt to your body and help to maintain your centre of gravity through shifting terrain, conditions and intensity levels. Each of the straps is adjustable to get the best fit according to the weight of your load while the removable EVA shim offers contouring in the lumbar region for extra comfort. Other features including the integrated raincover, the removable shock cord retainers and the sidewinder bottle holster help to keep your gear dry and organised while the internal divider and the U-zip access to the main compartment make life a little easier while on the move. There is also a small detachable daysack that doubles up as a hydration bladder pouch on the inside of the main compartment.